As part of my Germany trip last month, we also planned a side trip to Rome, where we spent three days, with several stops along on the way. My grandmother, my German great aunt (with whom we were staying), and I left Barnstorf on March 6th to spend a few days in Oer-Erkenschwick where my great uncle lives. He showed us around Recklinghausen and area the next day, and our plan was to start driving toward Rome on March 8th. The destination for the day was Heidelberg in the south of Germany, a three-hour trip on the Autobahn from Oer-Erkenschwick. Before my grandmother and I left for Germany, I had emailed one of my German birding friends, Jochen, whom I’ve known for several years through his blog and mine, and his writing at 10,000 Birds. We didn’t get the chance to meet last year since he lives in the Ulm area which is about six hours from Barnstorf. Jochen works near Heidelberg and since we were traveling through, we were able to co-ordinate times to meet and go birding together. We decided to meet at the McDonald’s in Heidelberg around noon. 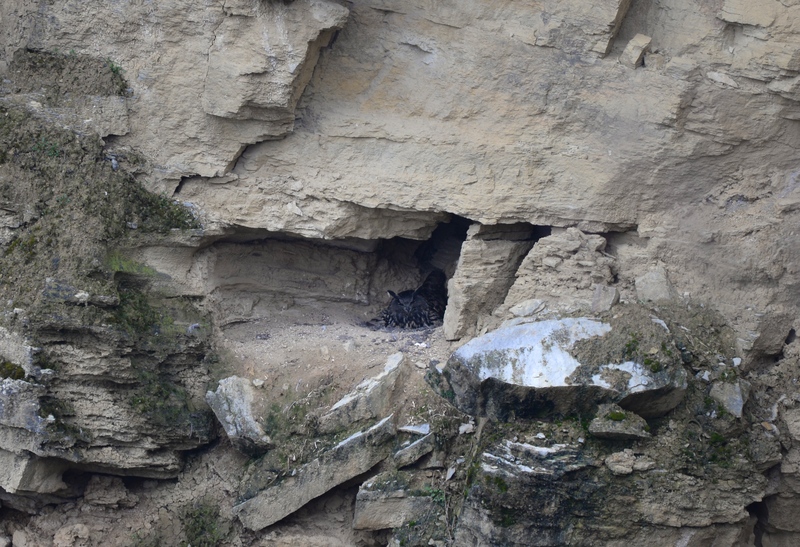 We arrived at 12:30 and after introductions, my grandmother, great aunt, and great uncle went inside for a coffee and a rest, while Jochen and I drove to the old Leimen quarry to see the nesting Eurasian Eagle Owl. The owl was sitting on the nest in plain view — if you know where to look. It was such a treat to see the owl, and I took some photos and watched it for a little while before we returned to the McDonald’s. 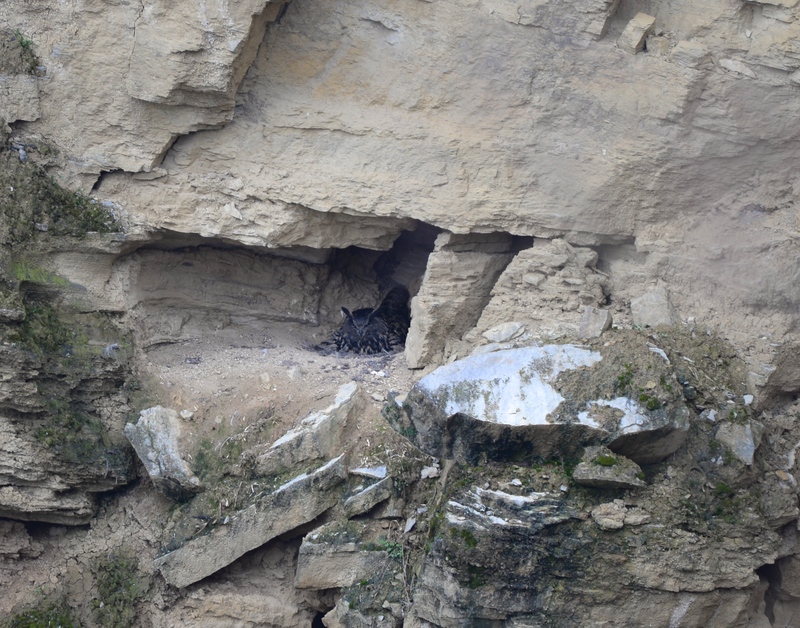 Eagle Owl update #1: as of the end of March, the owls had abandoned the nest and no-one is certain where the adults went or why they gave up on their nest. Eagle Owl update #2: Jochen let me know the other day that the owls have re-nested, so hopefully this nesting attempt will be successful. After meeting up with my family, I went with Jochen in his car and everyone else followed in my great uncle’s car as we drove to Korsika Island within the old Rhine forest (the former “bayous” of the Rhine). 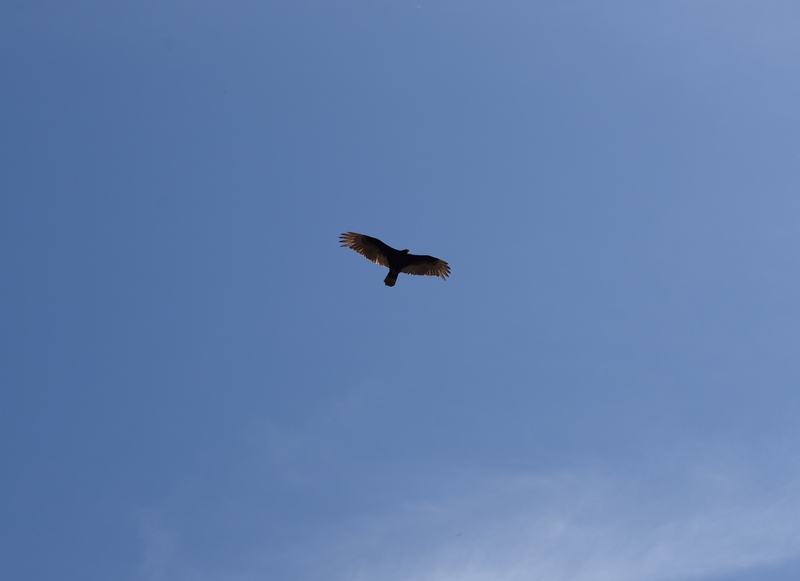 On the drive to the island, Jochen spotted a Black Woodpecker flying over the road! We were incredibly lucky to see it and it was my only sighting of one throughout the whole trip. 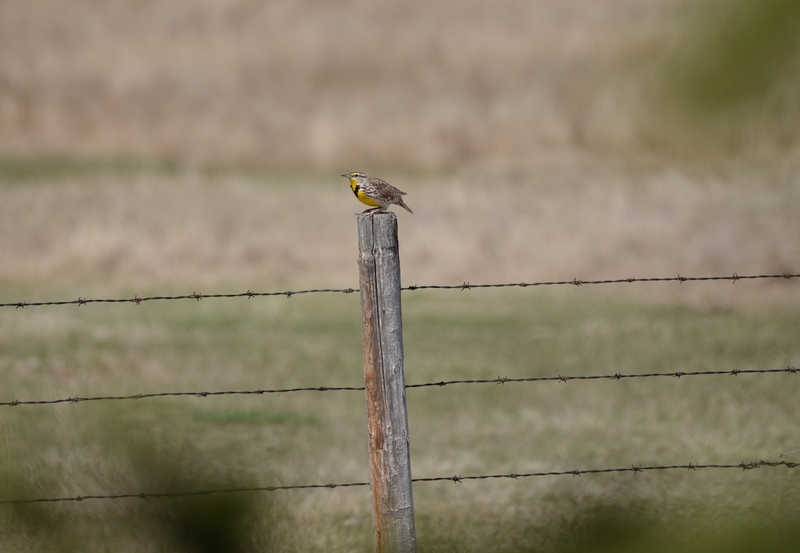 There was a chance to see Crested Larks in a residential area along the way. We stopped to look, but there were no larks around. 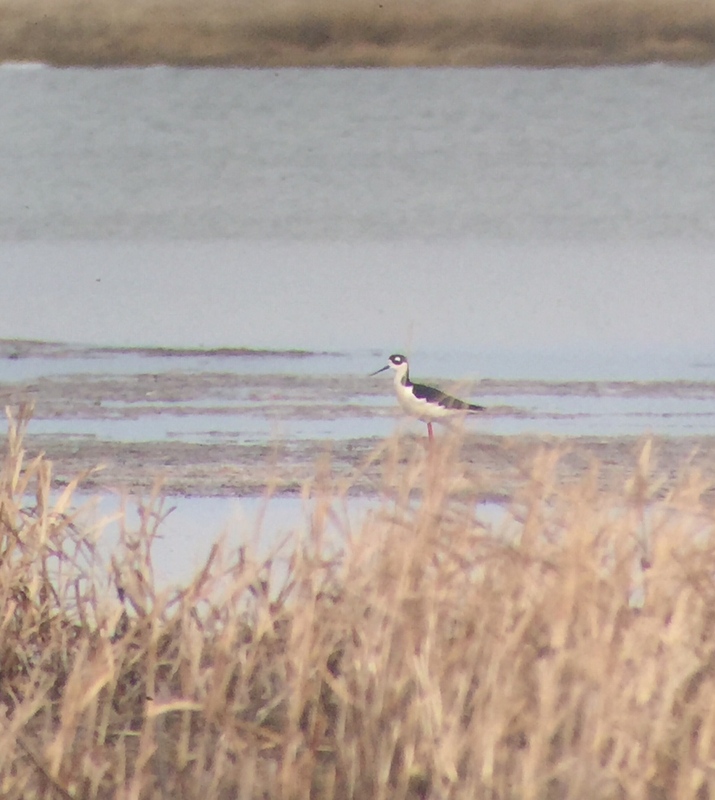 A Smew had been reported a few days earlier at Korsika Island, so there was a chance it would still be around. 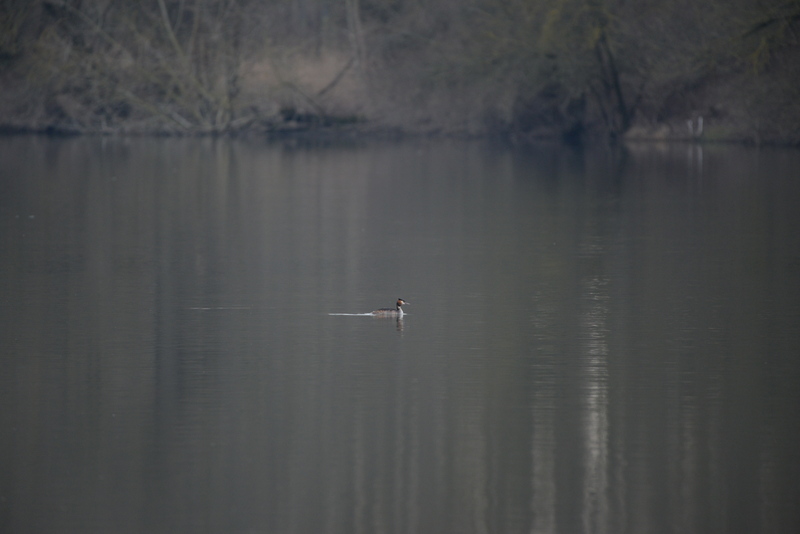 We scanned around and found Little Grebes, Common Pochards, Great-crested Grebe, Common Linnets, Great Cormorants, Mallards, and two drake Mandarin Ducks (a lifer for me and now countable in Germany since there is a self-sufficient breeding population), but no Smew. 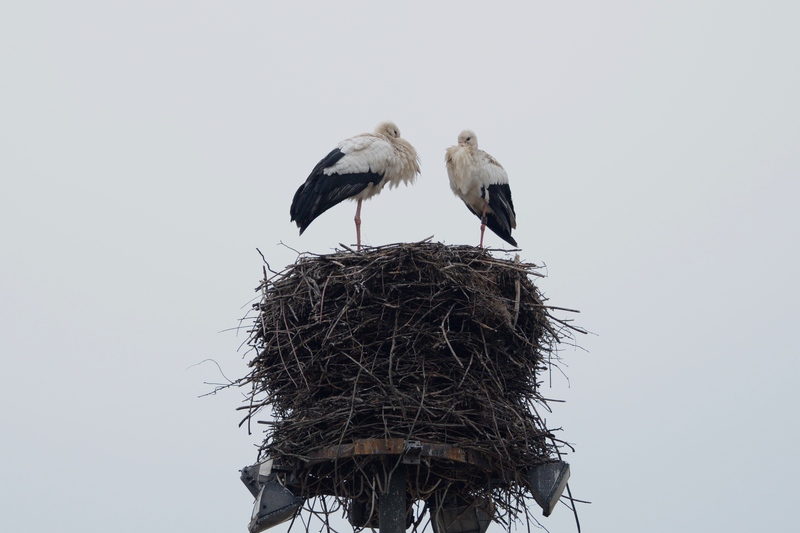 For some reason, on the way into the forest we missed seeing the huge stork nest and the two adult White Storks, but we saw them on the way out of the forest. 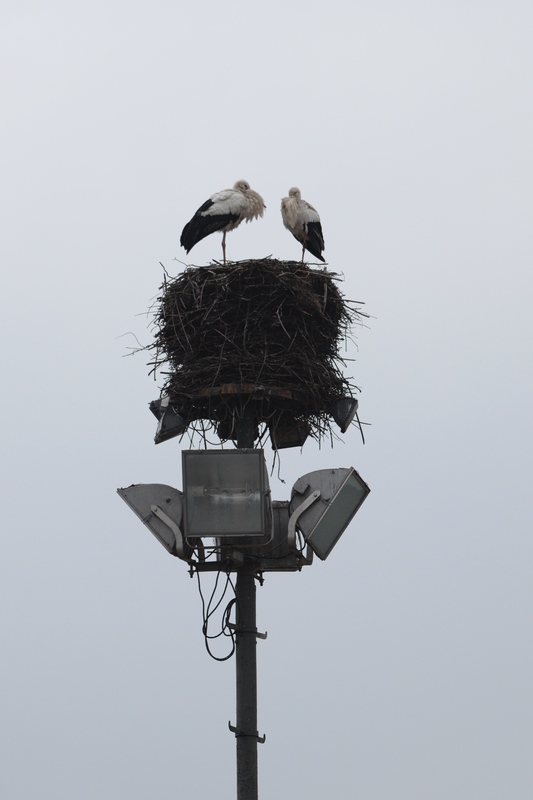 Their nest is located near the village and along the road so we got out of the vehicle to look at the storks, which didn’t seem to mind our presence. Our last stop of the day was at the well-known nature conservation area, Wagbachniederung. 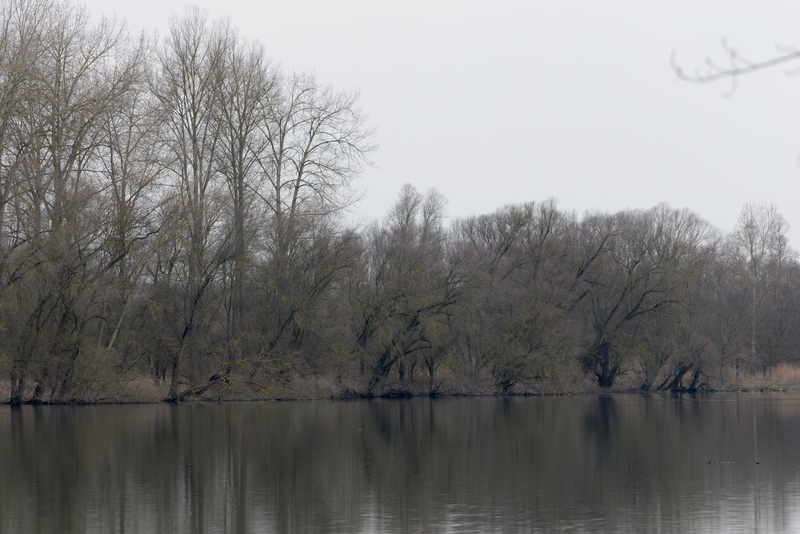 The Naturschutzgebiet (nature reserve) Wagbachniederung is located on the right bank of the Rhine in Waghäusel southeast of Speyer, between Mannheim and Karlsruhe and in the eastern part of the valley and covers 224 hectares. The Wagbachniederung was formerly a Rhine loop which was separated from the main stream in a natural way about 8,000 years ago. It is made up of remnants of original Ried and wet meadows, an abandoned gravel pit, and mostly of sewage and sludge ponds from a sugar factory in Waghäusel. 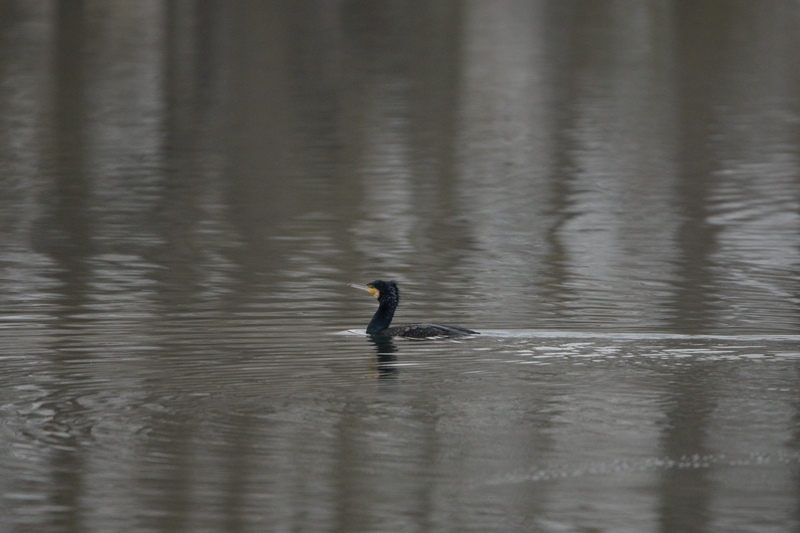 The wetland is an important stopover for migratory birds, especially shorebirds. 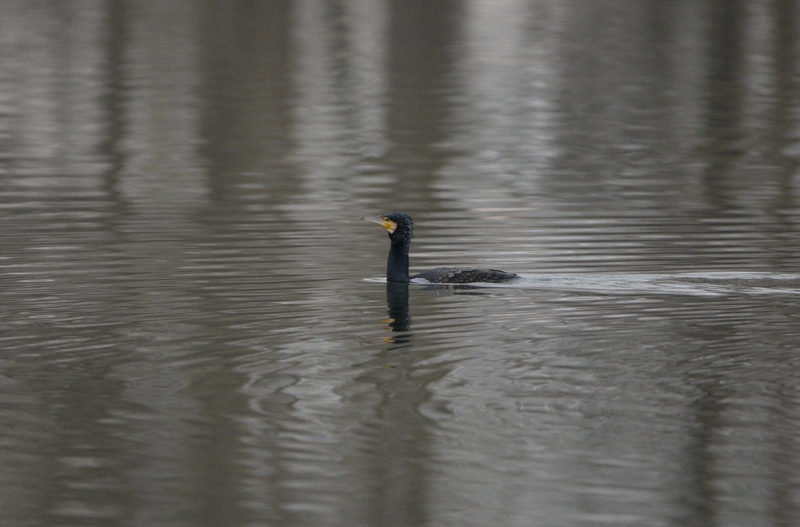 My relatives visited a nearby monastery while Jochen and I walked around the wetland. We arrived around 3 pm and had just under an hour to bird the Wagbachniederung. Graylag Geese, Canada Geese, Eurasian Teals, Northern Shovelers, Common Shelducks, three male Red-crested Pochards, Northern Lapwings, Gadwalls, and Mallards were all swimming and feeding by the water. 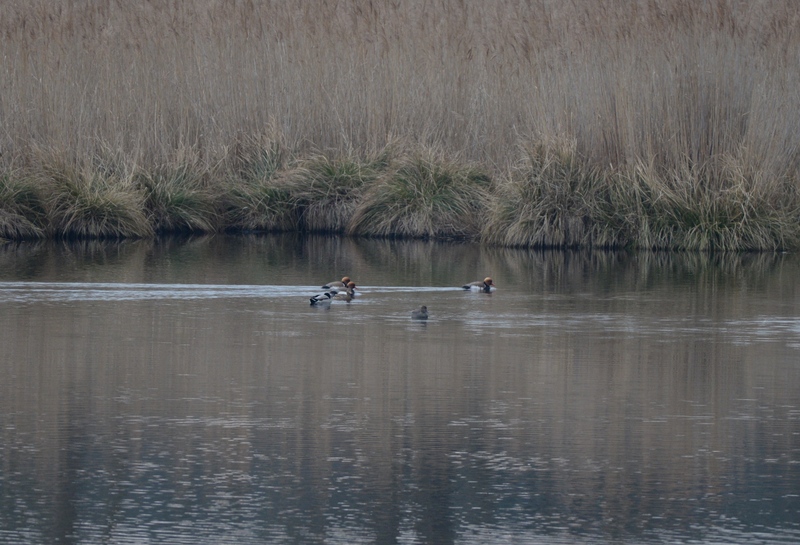 There was a slim chance we could a hear a Water Rail call, and almost on queue, one started calling! Common Reed Buntings also were present, and as our time was running out we moved on. 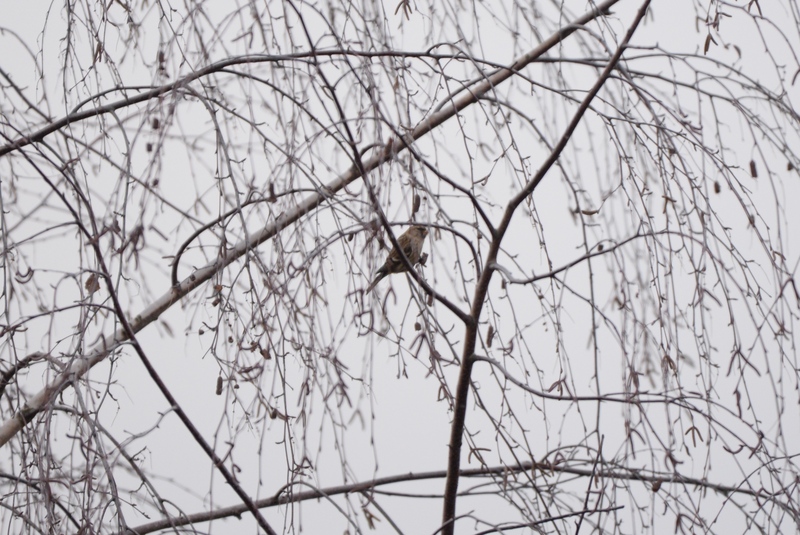 The three males, There’s a pathway lined with shrubs and trees between the bodies of water, and there were some European Goldfinches feeding with a single Lesser Redpoll, which Jochen said is a really good bird for the area and time of year. One of the thrush species I had missed seeing were Song Thrushes and as we passed the tree where the redpoll was feeding, a flock of Song Thrushes flew past. 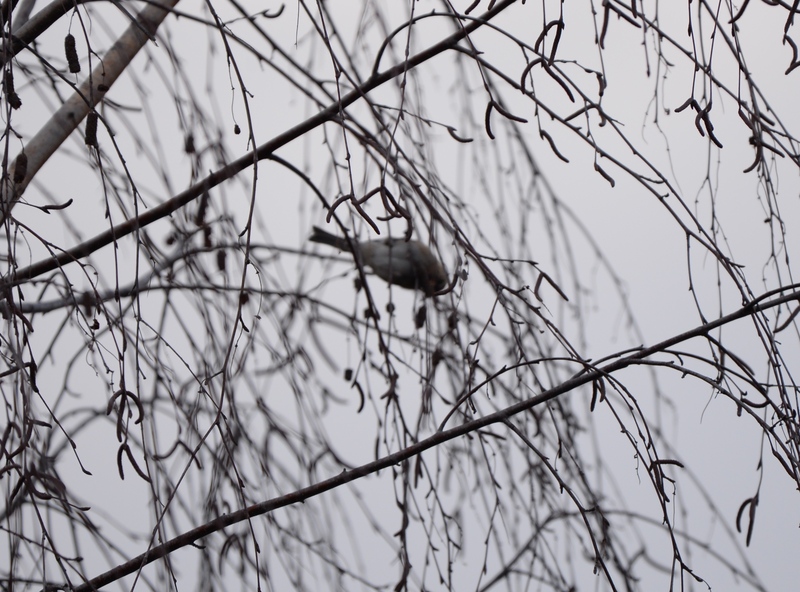 The redpoll was hiding behind the branches, so my camera couldn’t focus on the bird very well. We made it back to the parking lot just after 4. I had a really wonderful time and I’m so glad we had a chance to meet and to go birding together. I’d like to thank Jochen again for making time to show me around. 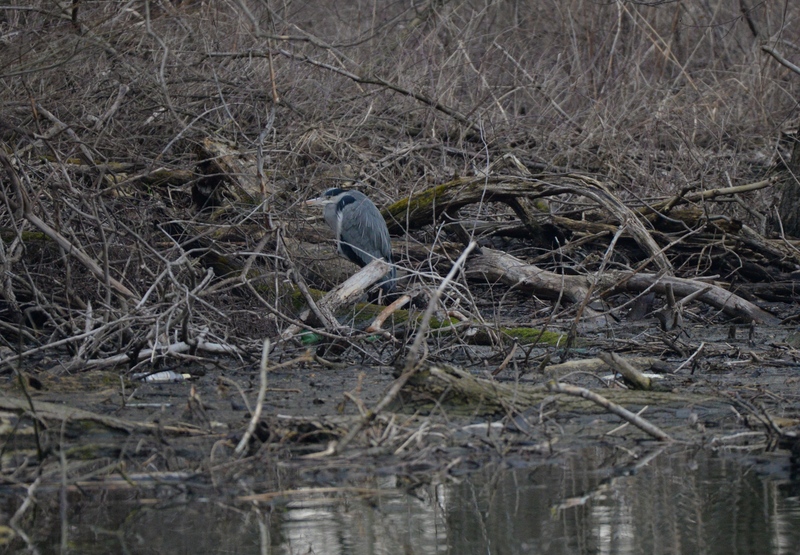 I saw lots of species I couldn’t have seen with out his guidance. 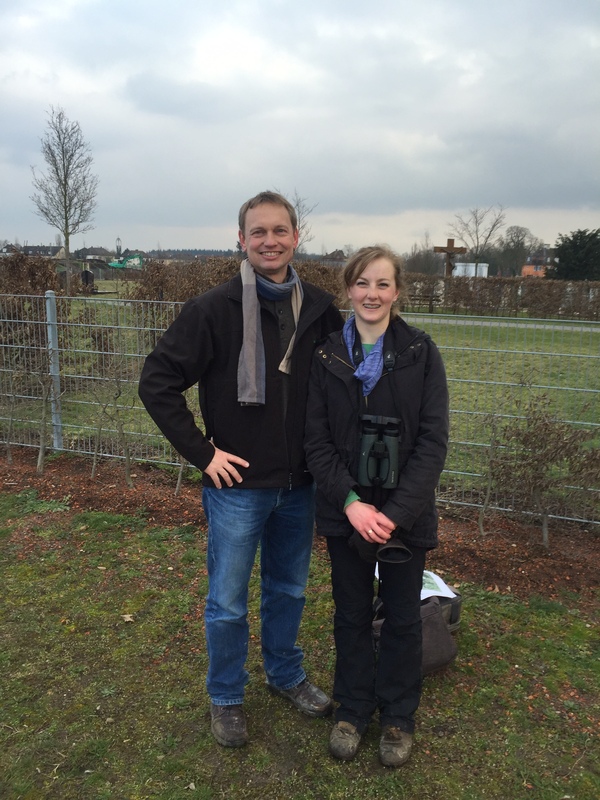 I’m hoping we can go birding again soon, Jochen! 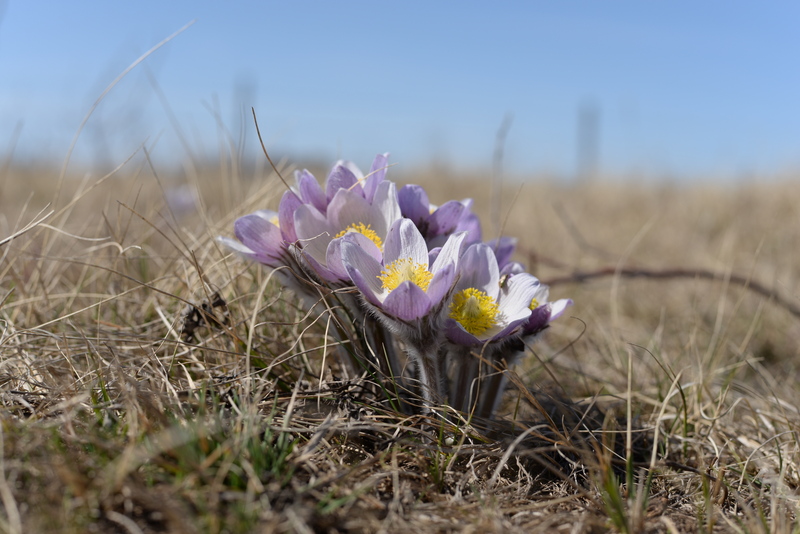 I was photographing prairie crocuses the other day when my first of season Turkey Vulture flew right over my head. Because of the flowers, I had just my small 50mm lens on my camera (not the best lens for far-off bird photography), but I was surprised at how well the photos turned out. A nice surprise on a spring afternoon! Alberta is in the Canadian sweet spot for hummingbird species, with three regularly occurring species. Rarer species often show up at feeders through the year, so it pays to keep your eyes open. Ruby-throated, Calliope, and Rufous Hummingbirds are the common species in Alberta. 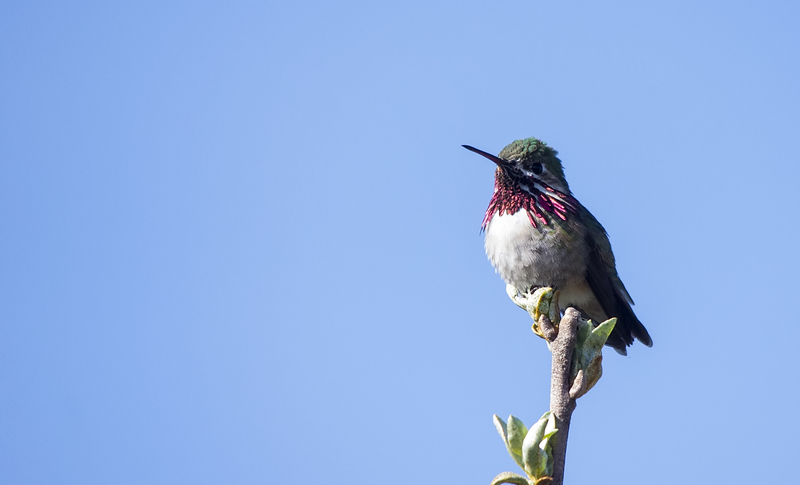 Anna’s, Black-chinned, and Costa’s Hummingbirds have also been documented in the province with a few records of confirmed sightings. 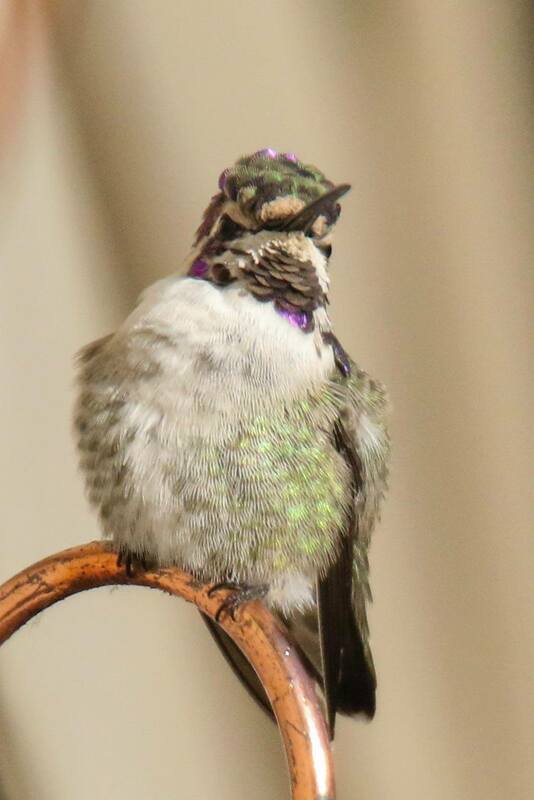 Hummingbirds start arriving in Alberta around the beginning to middle of May (depending on where you live), so put your feeders up at the beginning of the month. 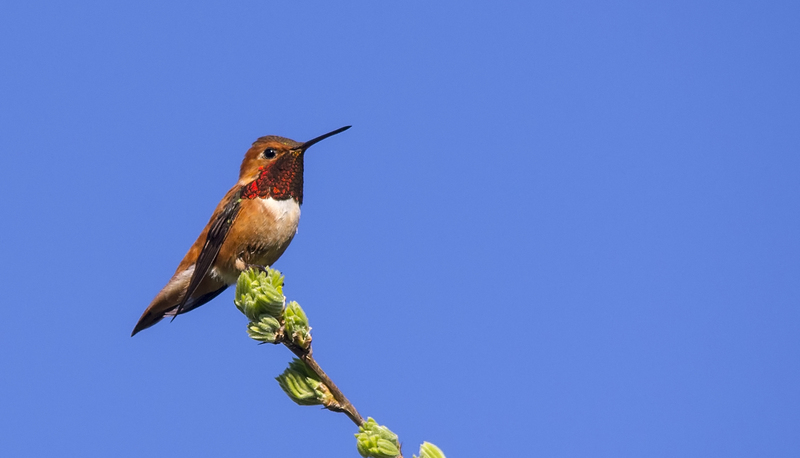 One of the largest bird-feeding myths surrounding the feeding of hummingbirds is that leaving a feeder out too late in the season will delay their migration. This is just not true. The urge to migrate far outweighs a feeder full of sugar water. 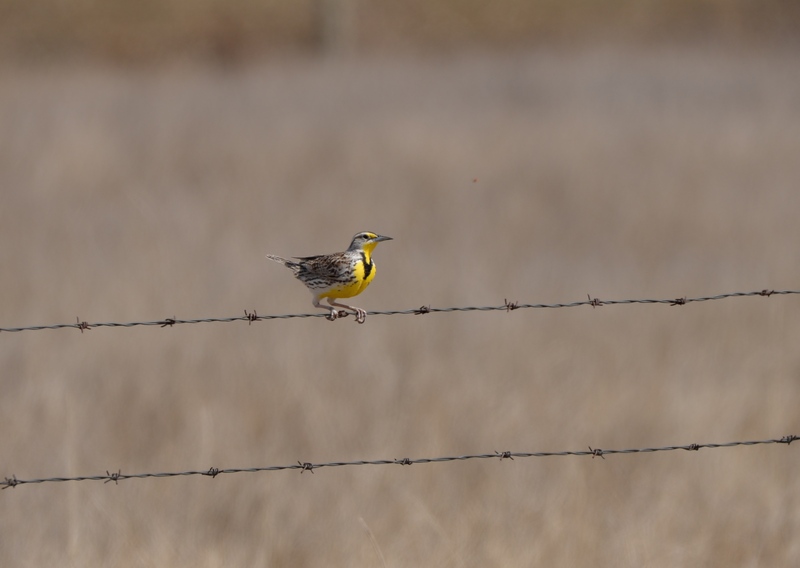 But leaving feeders up in the fall and getting them up early in spring may help early or late migrants passing through the area. 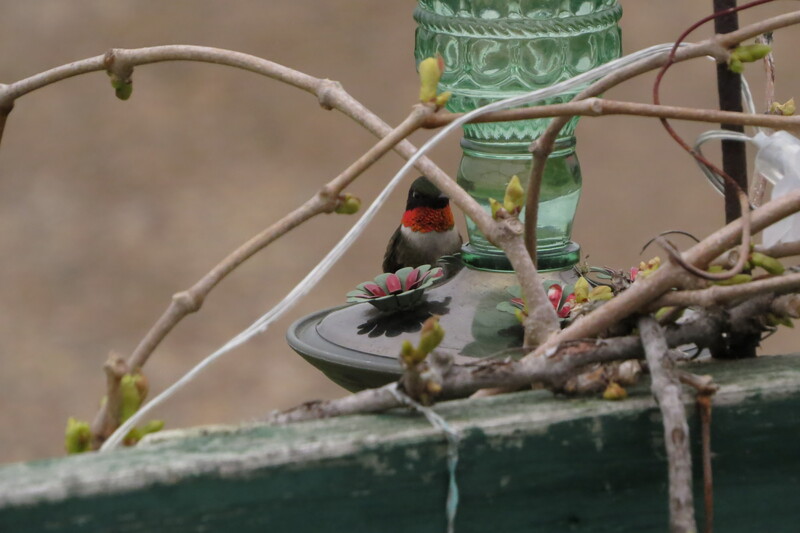 Take, for example, this wayward Costa’s Hummingbird that showed up in Sherwood Park last October and was seen at the same feeder for over a month and a half. Costa’s Hummingbirds rarely make it outside of Arizona and southern California, so it was very odd to have one show up in Alberta. The Costa’s Hummingbird that showed up at a feeder in Sherwood Park last fall. Photograph by Janice Hurlburt, used with permission. Many people get excited to have a hummingbird visit their feeders, so here are some tips for attracting and keeping hummingbirds in your yard, as well as the “recipe” for sugar water. Ruby-throated Hummingbirds have been documented in all regions of the province except the Canadian Shield, and have the largest breeding range of any North American hummingbird. Adult males are metallic green on the upperparts, iridescent ruby red on the throat, white on the underparts, and green along the sides. Adult females look similar to males but with a finely streaked throat, greyish belly, and buff along the sides of the belly. Immature males look similar to females but with red streaks down the throat. Ruby-throated Hummingbirds are long-distance migrants, flying non-stop over the Gulf of Mexico to southern Mexico and Central America to spend the winter. Left, a male Ruby-throated Hummingbird feeding on petunias. Right, a female Ruby-throated Hummingbird at one of my feeders. Calliope Hummingbirds are the smallest birds in North America, often misidentified as large bees. Calliope Hummingbirds frequent the foothills, mountains, and the Peace River area in Alberta. Calliopes can be identified by their overall small size, green upper parts and pink streaks on the male’s throat that form a V-shaped gorget. Females have dull white throat, a buff chest, and belly. 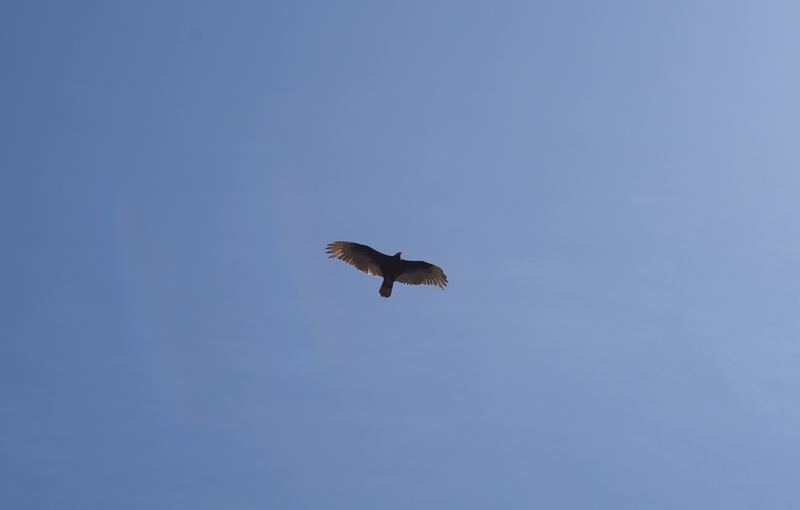 While Calliopes might be small, they are extremely territorial and can chase away birds as big as Red-tailed Hawks from their breeding territory. The hummingbird gets its name from Calliope, the muse of eloquence and epic poetry in ancient Greek mythology. A male Calliope Hummingbird. Photograph by Daniel Arndt, used with permission. Rufous Hummingbirds are known for being very feisty and extremely territorial. 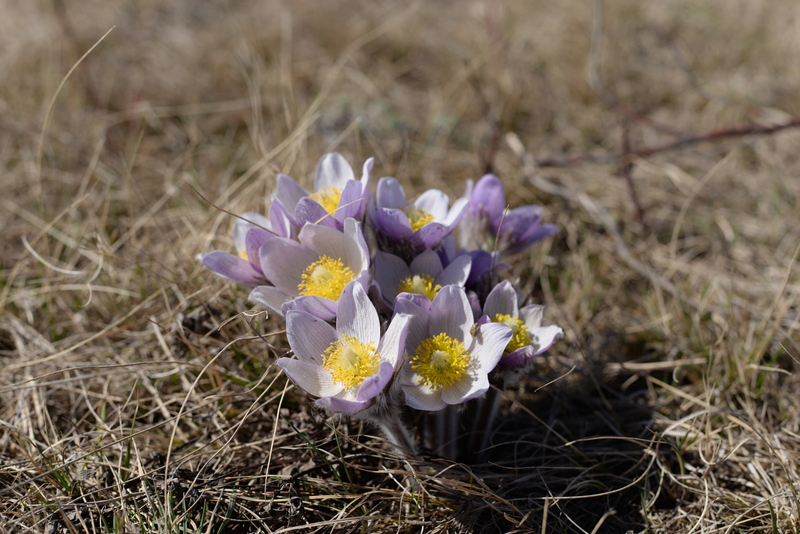 Look for them in the Rocky Mountains, foothills, and the boreal forest. 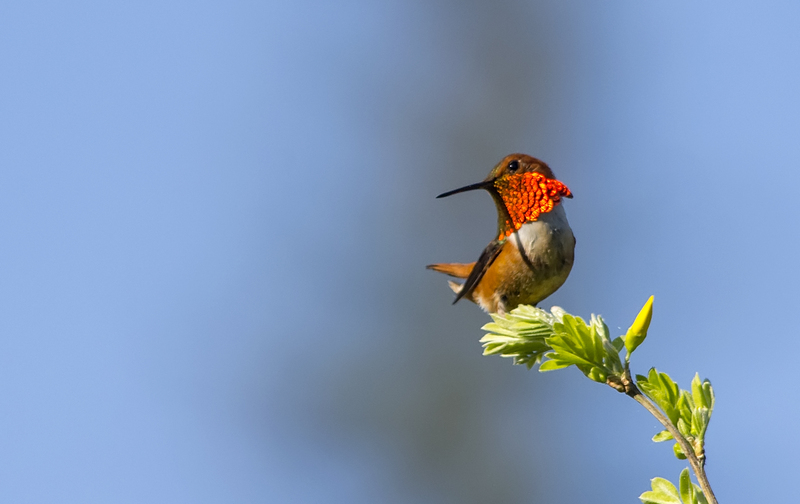 In bright lighting, male Rufous Hummingbirds are bright orange on the back and belly, with an iridescent red throat. 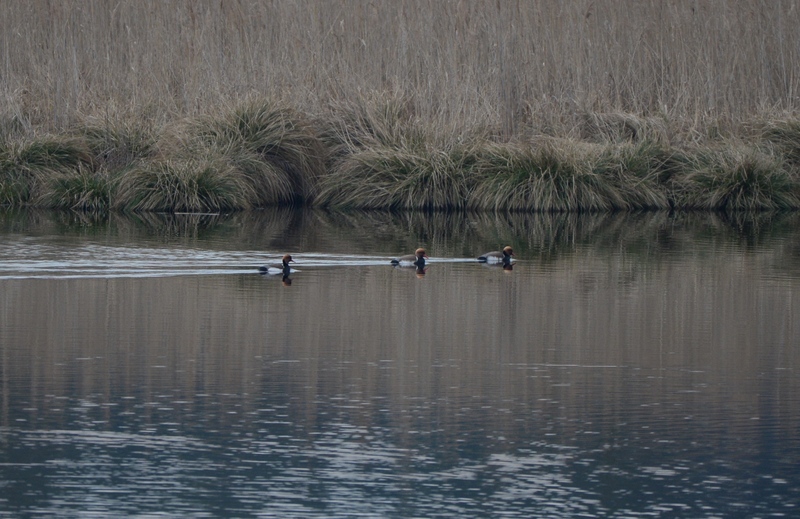 Females are green with rufous flanks, rufous on the base of the rounded tail, and a few orange spots on the throat. Rufous Hummingbirds have the longest migration of any hummingbird species, travelling more than 3,500 miles from their breeding grounds to their Mexico wintering grounds. 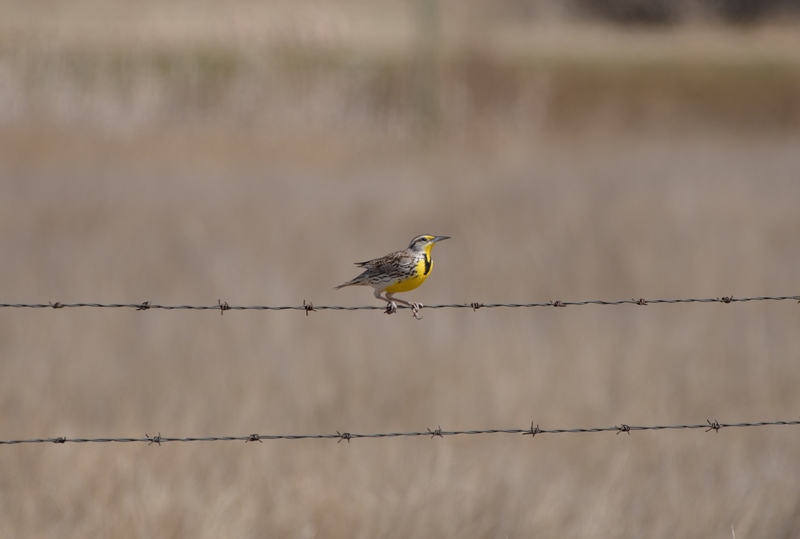 They travel north up the Pacific Coast in spring and return by the Rocky Mountains in the late summer and fall. A male Rufous Hummingbird. Photograph by Daniel Arndt, used with permission. I’d like to thank Janice Hurlburt and Daniel Arndt for letting me use their hummingbird photos. 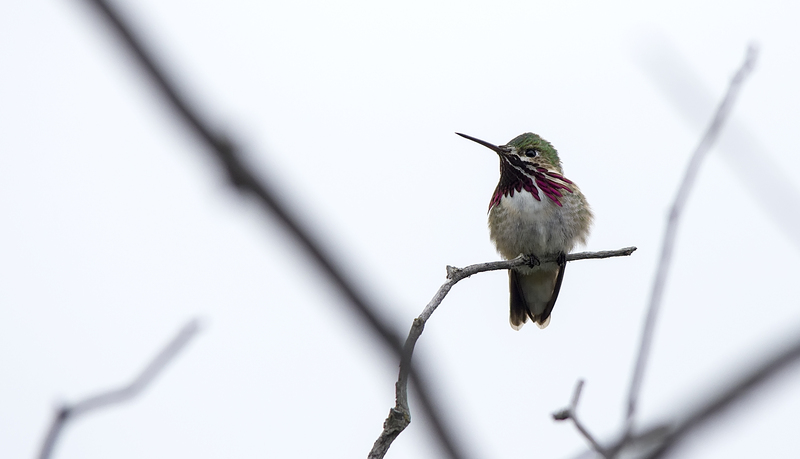 You can find more of Daniel’s great hummingbird photographs on his Flickr page. — Hummingbirds are native species of the New World and are not found outside of the Western Hemisphere. A majority of the species are found in South America. — A group of hummingbirds has many collective nouns, including a bouquet, glittering, hover, tune, and shimmer of hummingbirds. — A hummingbird’s bright throat colour (gorget) is not caused by feather pigmentation, but by iridescence in the arrangement of the feathers and the influence of light level and moisture. — An average hummingbird’s heart rate is more than 1,200 beats per minute. — A hummingbird’s maximum forward flight speed is 48 km, or 30 miles, per hour, though the birds can reach up to 96 km, or 60 miles, per hour in a dive. 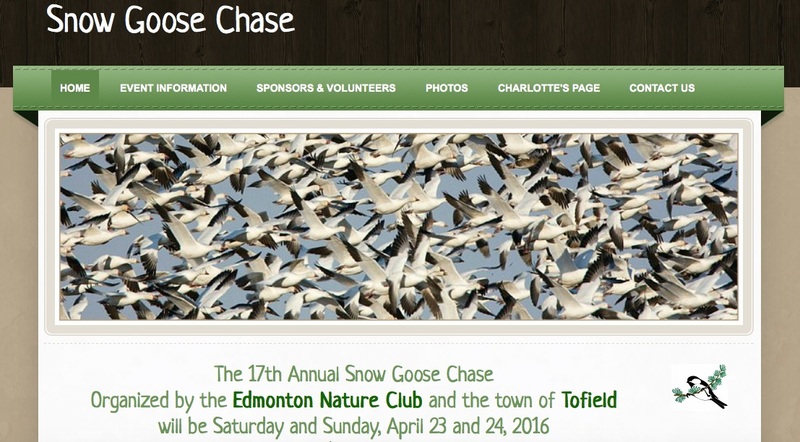 The 17th annual Tofield Snow Goose Chase hosted by the Edmonton Nature Club is coming up very soon, on Saturday, April 23rd and Sunday, April 24th, at the Tofield Community Hall on Main Street from 9:30 am until 12 noon, followed by bus rides into the countryside to see the Snow Geese and other arrivals. 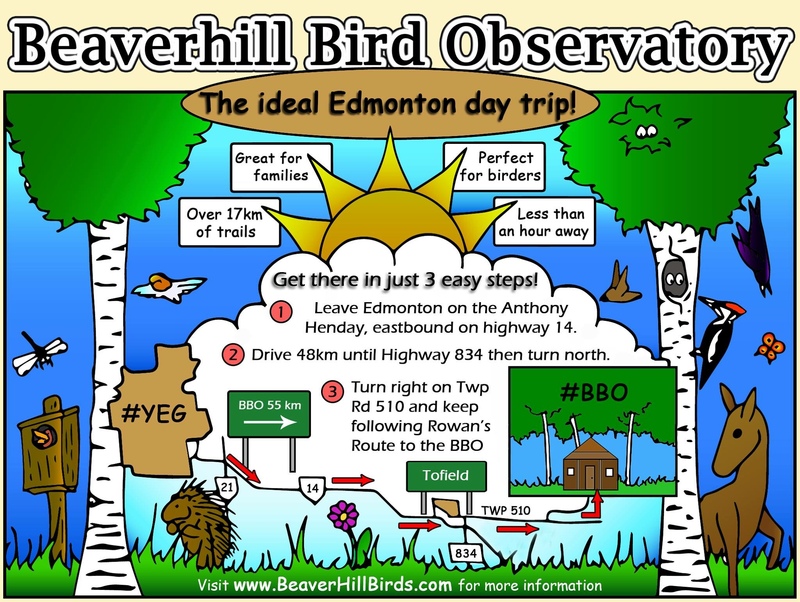 In the morning, stop in at the Town Hall to see the displays and exhibits from the Edmonton Valley Zoo, the Beaverhill Bird Observatory, and meet John Acorn (aka “The Nature Nut”), and Pete Heule (“The Bug Guy”) from the Royal Alberta Museum. 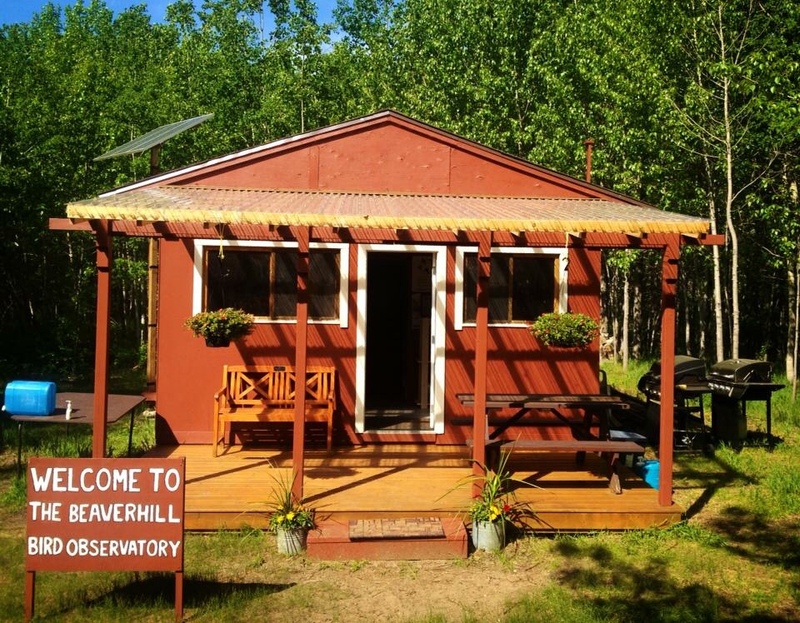 I’ll also be there at the Young Naturalists’ Corner, so please stop by and say hello! 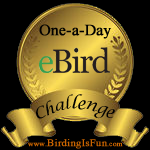 I’ll have a display of nature-related books, and might even be giving away a few prizes! Here are my two blog posts about the 2012 and 2013, and also my page on Snow Goose Chase Resources.